The Adult is two meters tall with a strong tail that extends to the height of the body, and it's generally bipedal in the specimens that have been encountered by humans. 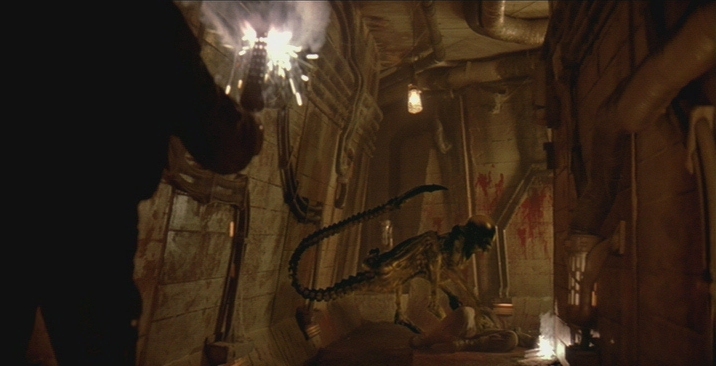 However, the movement and shape of the Alien encountered in Fury 161 in "Alien 3" shows that the Xenomorph adopts certain physical attributes of the host's anatomy. when infecting the species of mankind, the Alien may have adopted our characteristic "intelligence." Speculation suggests that the Xenomorph emits no body heat. This is the assumption mainly because the creature produces no effect on heat-detecting devices. Note: The Aliens in "Aliens" did not show up on infared. The long head of the Adult may be due to housing an enlarged brain. This does not necessarily mean that the creature possesses a greater natural or innate intelligence. However, this could signify that the Alien's brain is more complex than that of other Earthly terrestrial organisms. 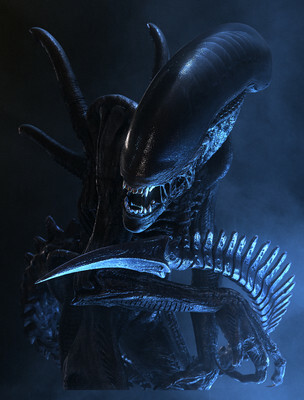 It has been speculated that a translucent, featureless cowl on the exterior of a Xenomorph's head shows it is young. 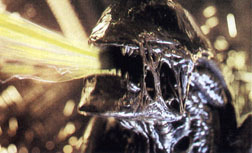 As the creature ages, the smooth cowl is lost, exposing distinct textured lining like that of the Xenomorphs encountered on LV-426 during the movie "Aliens". The reason for the cowl is probably to serve as a protective shell for the still developing cranium. The smooth heads of each alien(s) in the other three movies bears testament to this speculative fact. b) suction-like, or textured structures on its hands, feet, and tail. The Adult Xenomorph has five spine-like appendages extending from its back, and the uppermost can be seen to be no more than an exaggerated vertebrae which could aid in warding off rear attacks or just to make the Xenomorph seem larger. The other four tube-like appendages have been hypothesized to contain glands that secret a type of resin much like that used to construct a hive which would aid the Xenomorph in dropping down onto prey or ascending great heights while leaving the arms, legs, and tail free for use. It's possible they are used to secret the resin that the hive is constructed of, but it would be easier just to have the Xenomorph regurgitate that substance. It should be noted that the Adult Alien encountered on Fiorina 161 did not have dorsal spines. This is potentially because the spines would have interfered with bodily movement, considering the dog-like shape of the beast. The Alien organism also has a tongue-like set of jaws contained within the elongated head. These secondary jaws of the Alien which are part of the modified tongue are used in an offensive manner and can spring twelve inches outward from the Xenomorph's mouth. The primary purpose of these jaws is to immobilize a potential host. However, they can also be used to intimidate prey and perform basic motor functions, such as activating the liquid nitrogen button in Alien Resurrection. While tense, the strength is greater than bone, and once it reaches its maximum length its jaws close and the tongue is retracted. The Adult Xenomorph is able to spit a concentrated ray of venom toward a potential host that can dissolve flesh and enter their blood stream eventually rendering the potential host immobile. The Xenomorph's tail is very powerful and it's used for agility and balance, an offensive and defensive weapon, and immobilizing potential hosts with its stinger. In aquatic situations it allows the Adult Xenomorph to move with spectacular grace and agility. The Xenomorph's detection organs are all located in or around its head, and are extremely acute. It appears the Xenomorph feeds upon humans, but what its dietary needs are have yet to be determined. Also, what type of internal organs an Adult contains is unknown along with its life span.